Keoki Saguibo was born and raised on the fabled North Shore of O’ahu, and as a result is one of the most versatile surfers in the world. He can seamlessly transition from noseridng one-foot Chun’s to charging 20-foot Waimea Bay like no one else. In addition to his prowess of skillfully sliding waves, Keoki is also a talented, up-and-coming water photographer. His favorite muse is his girlfriend, Rosie Jaffurs, but his photos of pro surfers riding the infamous Banzai Pipeline is quickly gaining him notoriety. 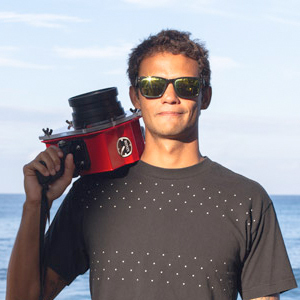 Keoki represents the next generation of Hawaiian watermen: individuals who are comfortable riding a variety of equipment in the ocean, but posses an artistic eye to capture stunning images of aquatic marvels.